Located in Nanhu Village, along the Hexi Corridor and 43 miles southwest to City in Gansu Province, Yangguan Pass is one of the two important western passes (the other one is Yumenguan Pass) of Great Wall in Western Han Dynasty (206BC -24AD). The Emperor Wu ordered to build it in the purpose of consolidating the frontier defense as well as developing the remote western region. In Chinese, Yang means the south. Because it is lying to the south of Yumenguan Pass, people gave its name - Yangguan Pass. 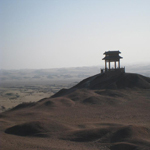 Together with Yumenguan Pass, it has also witnessed the prosperity of Silk Road in the past times. In Tang Dynasty (618 - 907), it welcomed the glorious return of Xuan Zang, a great monk who pilgrimaged to the west in search of Buddhist scriptures. Many Chinese get to know this important pass mainly from the poem Farewell to Yuaner to Take Office in Anxi, written by Wang Wei, a famous poet in Tang Dynasty. From the last two lines "Oh, my friend, I sincerely entreat you to have another cup of wine; you will see no more friends west out of the Yangguan Pass. ", we can see the Yanguan Pass has always been the place of desolation and sadness since ancient times. In the Song (960 - 1279) and Ming (1368 - 1644) because of the decline of the Silk Road, it was generally forgotten by people. For years and years, the flowing dunes have eroded this pass into a broken beacon tower, standing alone in the boundless desert. It measures 15.4 feet high and 8.7 yards wide. Around the relic, you cannot even see the dismantled walls, because they were all eroded by the wind and buried under earth. South to the pass, there is a "Curio Beach". It is a small valley where you can find lots of dynasties' tiles, coins, weapons, and decorations. Today's Yangguan Pass is not only a historic place of recalling the remote past, but also a hometown of tasty grapes. Come here, appreciate the beauty of vicissitudes of the Great Wall, enjoy the natural view combined by oasis, desert and snow peaks, and taste the juicy fruits.